Michael TRB Turnbull explores the places and poetry around Edinburgh which are connected to Scotland's national bard. "In his several business visits to the city Robert Burns came principally to be present at the printing and production of his poems, but he also made a deep impression on many members of Edinburgh society for whom, as a 'ploughman poet' he was something of a curiosity. The inscription on the Burns statue in Leith is just one of the memorials dedicated to the Bard. Burns, however, also had charm and a roving eye. Eliza Burnett was the daughter of James Burnett ,the lawyer Lord Monboddo, and was thought to be one of the most attractive and intelligent women of her day. Another of his friends was William Smellie, who printed the second 'Edinburgh' edition of Burns' poems and introduced him to the notorious Crochallan Fencibles. This exclusive drinking club at Dawnay Douglas' tavern in Anchor Close sat next to Smellie's printing house in the High Street. His heart was warm, benevolent and good." Another acquaintance was the bookseller, publisher and Lord Provost William Creech. Creech had taken over Allan Ramsay's premises in the Luckenbooths, a ramshackle building beside the north wall of St Giles High Kirk. It was at Creech's amiable establishment that all the intelligentsia of Edinburgh assembled, like bees converging on a honey-pot. 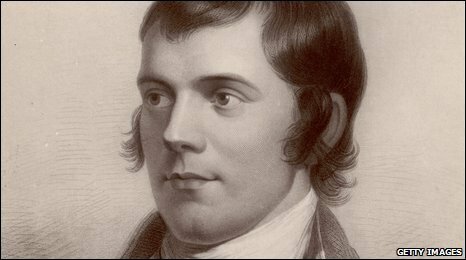 And still his precious self his dear delight"
Although nine years older than Burns, the Bard had a great admiration for his fellow-poet Robert Fergusson, who died in tragic circumstances. His bronze likeness stands outside the Canongate Kirk. To pour her Sorrows o'er her poet's Dust." Of all the ladies that Burns met and loved in Edinburgh, it was Mrs Agnes MacLehose, née Nancy Craig who created the most lasting impression on his writing. In December 1787 Nancy encountered Robert Burns at a Miss Nimmo's house in Alison Square, in a building long since demolished. Nancy then invited Burns to her house in Potterrow for tea. However, the day before they were due to meet Burns injured his leg in an accident with his horse and was confined to his room for six weeks. This did not deter the flowering of their relationship as during this time of forced separation he and Nancy wrote letters to each other. He styled himself "Sylvander" and she was "Clarinda". Mementoes of Burns and Nancy Craig are on display at the Writers' Museum. Many of Burns' autograph letters and literary works, including the correspondence between "Sylvander" and "Clarinda" is at the National Library of Scotland in Edinburgh. One of Edinburgh's High School masters who was friendly with Burns was William Cruickshank. Burns stayed with Cruickshank at his house in St James Square and it was for Cruickshank's daughter, Jenny, that he wrote his 'A Rose-bud by my early walk'. In English nane e'er kent them." Perhaps the most tantalizing meeting that Burns ever had took place sometime during the winter of 1786-87. At Sciennes Hill House, the home of Professor Adam Ferguson, the 16-year old Walter Scott, later to be the great novelist, caught the eye of Robert Burns by being the only person in the room who could identify the lines of verse written under a print of a dead soldier which hung on the wall. Hearing the young man identify the lines, Burns gave him a glance of admiration, adding: "You'll be a man yet, sir!" Scott only saw Burns once again when the poet was examining the contents of a bookstall near St Giles. On that occasion Burns did not notice him! 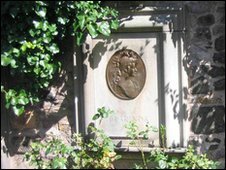 Today, there are two main memorials to Robert Burns in the city. 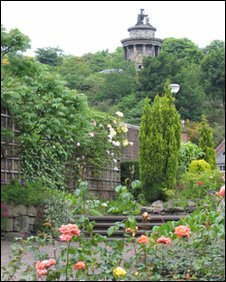 On the south side of Regent Road is the Burns Monument designed by Thomas Hamilton, a variation of his earlier monument to Burns at Alloway. Originally, the building housed the fine marble statue of Burns by John Flaxman. This is now at the Scottish National Portrait Gallery and the relics of Burns previously contained in the monument are now at the Writers' Museum. 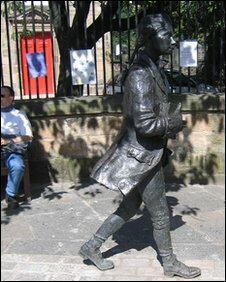 In Bernard Street, Leith, the bronze statue of Burns by D. W. Stevenson faces up Constitution Street to Edinburgh. 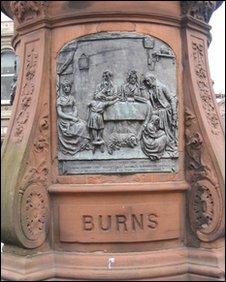 The statue was a gift of the Leith Burns Club." More information in Michael T R B Turnbull's "The Edinburgh Graveyard Guide: A Spooky Saunter Through Edinburgh's Chilling Cemeteries" and "Curious Edinburgh".